The History of the site of Caernarvon Castle dates back to antiquity. The Romans built forts in this area and Hillforts, built by the Celts, and a Norman Motte and Bailey castle were also constructed within this location. The Norman Earl Hugh of Rhuddlen built a stone castle at the location in 1090. The Druid Wizard, Merlin, and several prophecies, were strongly associated with Caernarvon. Merlin was believed to have been born in a cave outside Caernarvon. For more information click Caernarvon Castle Welsh Mythology. The name Caernarvon is believed to be derived from 'Caer Myrddin' meaning Merlin's town or fortress. King Edward I was very aware of the old myths, legends and prophecies surrounding Caernavon. King Edward knew that if he could be seen to fulfil an old Celtic prophecy that his invasion and triumph over the Welsh would be given the credibility that he craved. King Edward wanted to draw comparisons between himself and King Arthur - and any other ancient Kings who were revered by the Britons. It is no coincidence that Caernarvon Castle was built differently to the other Welsh castles! The master builder and architect Master James of St George would have been very aware of these myths and legends. And he designed Caernarvon Castle accordingly! Caernavon was seen as the capital of North Wales and became the English administrative centre. Edward's son, who became King Edward II, was born at Caernavon Castle and given the title of the ' Prince of Wales'. Since 1911 the castle has been the location for the investiture of the Prince of Wales. The design and architecture of Caernarvon Castle is steeped in Welsh mythology. Caernavon Castle was used by the Royalists during the English Civil War in 1642 and successfully with held three sieges during this war. Caernarvon castle was built to embody both history and legend. The walls of the Caernarvon Castle were given a striking patterning with bands of different coloured stone - an allusion to the "towers of many colours". The history of the building of Caernarvon Castle is fascinating. In just a relatively short period of time a significant number of new Welsh Medieval Castles were built or modernised under the instructions of King Edward I (1272-1307) including Caernarvon Castle. King Edward employed the services of an architect and master builder called Master James of St George to carry out many of these ambitious plans for a chain of Medieval castles to be built in Wales. Caernarvon Castle was built in Gwynedd, North Wales Wales on the Southern end of the Menai Strait. An important feature of Caernarvon Castle is its access to the sea. During the construction of Caernarvon Castle men, equipment and building materials were easily transported by boats to the site of the castle. Once Caernarvon Castle was built fresh supplies, provisions and reinforcements prevented the castle occupants from being starved into submission during siege warfare. The advantages of swift and easy accessibility via the sea ensured that the new fortified town, which was built at the same time as the castle, became a successful and prosperous stronghold for its English inhabitants. "In case you should wonder where so much money could go in a week, we would have you know that we have needed - 400 masons, both cutters and layers, together with 2000 less skilled workmen, 100 carts, 60 wagons and 30 boats bringing stone and sea coal; 200 quarrymen; 30 smiths; and carpenters for putting in the joists and floor boards and other necessary jobs. All this takes no account of the garrison mentioned above, nor of the purchase of material, of which there will have to be a great quantity... The men's pay has been and still is very much in arrears, and we are having the greatest difficulty in keeping them because they simply have nothing to live on." 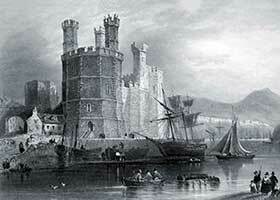 Caernarvon Castle was one of the ten key Welsh Medieval Castles which were commissioned by King Edward I. The Welsh Medieval Castles built by the English under the direction of King Edward I provided a power base for the Medieval Plantagenet King and ensured that the Welsh were subservient to the new English rule. Edward crushed the Welsh rebellion under Llewellyn ap Gruffudd and conquered his kingdom of Gwynedd in Northern Wales. Wales was conquered by Edward I and became incorporated into England under the Statute of Rhuddlan ( also called the Statute of Wales ) in 1284 - the building of Caernarvon Castle helped King Edward I to achieve his ambitions.